Please login or register to post to this forum. Welcome to the CLC boatbuilding forum! You’ll need to log in to post on this forum. Click here to get started if you aren’t already logged in. First posted in 1999, the CLC Builder’s Forum is for builders of CLC's many boats as well as others building wooden boats. The amateur and professional builders reading and posting on this forum have an enormous wealth of knowledge drawn from an amazing variety of boatbuilding projects. This forum is moderated by the CLC staff. Please observe our guidelines. 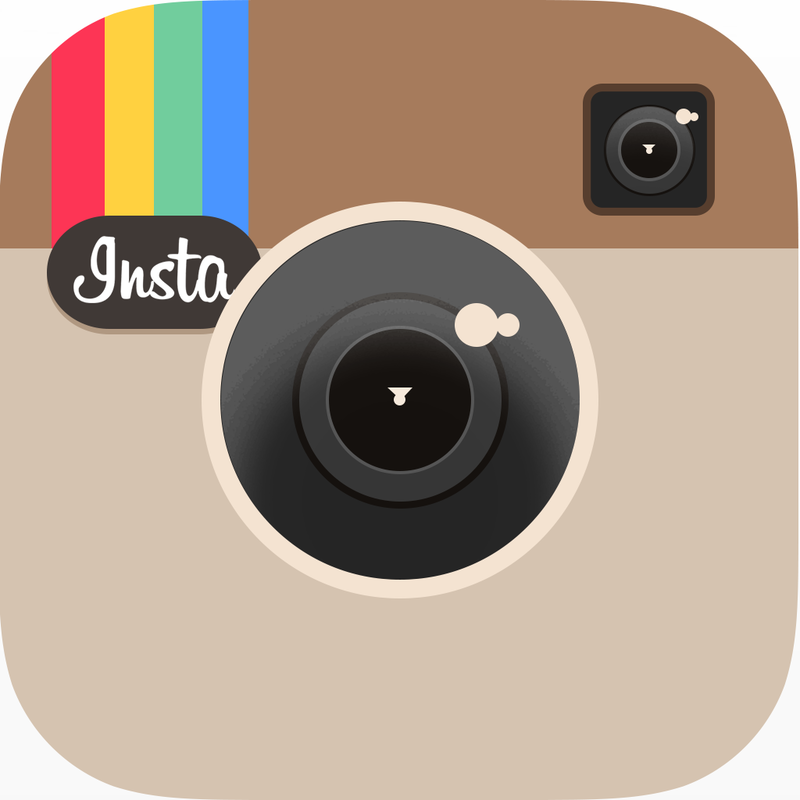 Click here for help on including photos in your forum posts. 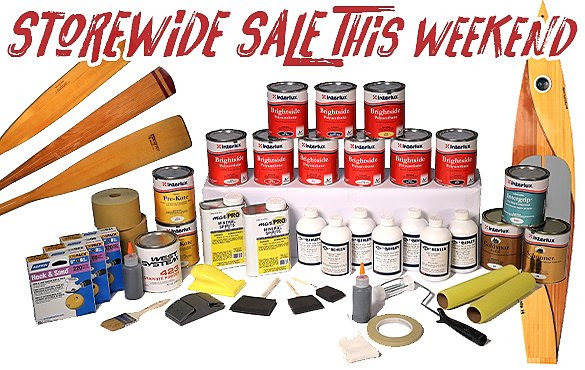 Looking for CLC's Used-Boats-For-Sale section? Click here. Looking for the CLC Teardrop Camper Forum? Click here. Welcome to Chesapeake Light Craft's Homebuilt Boat Bazaar. 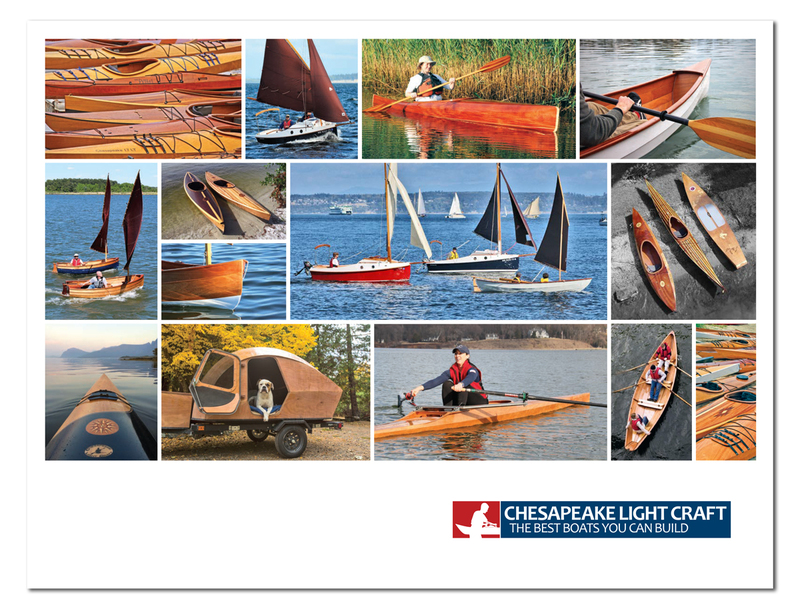 This is a free service of Chesapeake Light Craft for the legions of builders who want to build another boat, but need to make room in their garage first. Just as the title suggests, the Homebuilt Boat Bazaar is off limits to for-profit builders and businesses. The service is restricted to amateur boatbuilders and homebuilt boats (whether you personally built the boat or not). Chesapeake Light Craft will review all submissions and reserves the right to reject listings. Note: Listings older than 90 days will be purged from the Bazaar. Feel free to post your listing again. Chesapeake Light Craft has not inspected any of the boats listed for sale and does not make any express or implied warranties regarding the accuracy of the ad or safety of the boat for sale. Caveat Emptor. Note for sellers: There is a scam going around which targets anyone selling costly items online. A buyer will contact you who will know nothing about boats or what you're selling. They will offer to pay you MORE than your list price, but will ask you to send them a check back in the amount of the difference. (Their check will bounce, if it arrives at all, and you lose the difference.) Use your common sense and avoid this scam and its variations. A personal project of mine, this is a unique little boat that will appeal to people who like camping and small boats but don't have a big shop or storage space. Read the full write-up on this design here, and study high-res drawings here. Given a smaller audience, this might be one where we experiment with downloadable plans and an online, wiki-style manual. Instruction Manual Status: A wiki-style online manual is below. This will evolve, with more detail added. 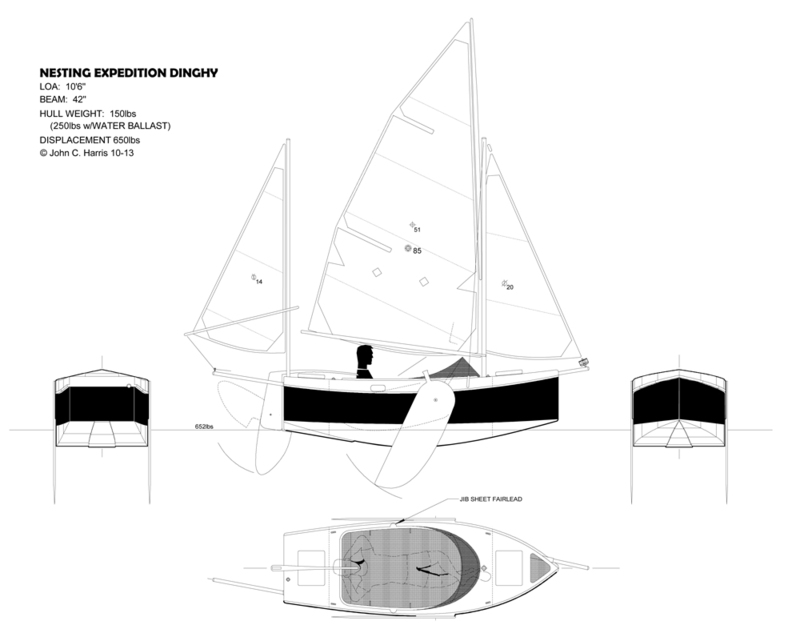 A personal project of John Harris, this is a 40-pound dinghy with a 425-pound payload. John's discussion of the design, with drawings and photos, is here. Dimensions are 72-1/2" x 40-1/2". Light and nimble, this is a good solution for someone with limited dinghy storage space, and the need to carry the boat solo across the parking lot. The boat rows well with six-foot oars and can carry two adults and a child in calm conditions. One person plus groceries could row a long way across a rough anchorage. 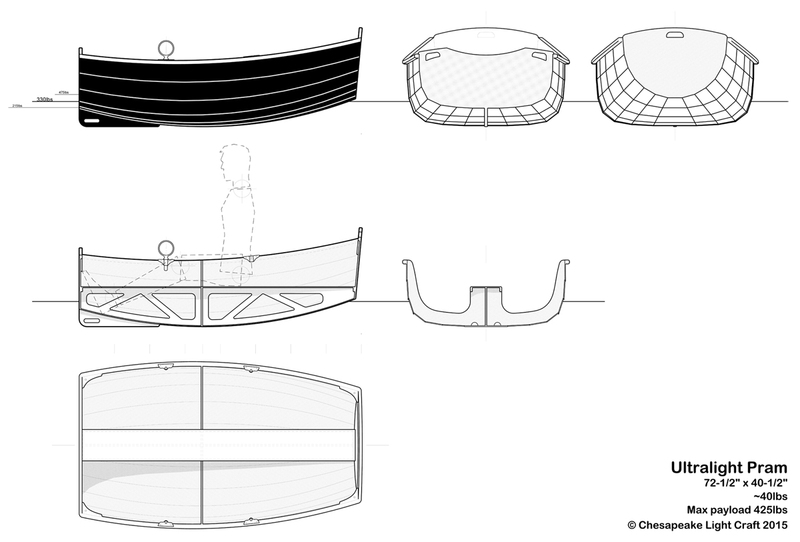 This is a rowing dinghy whose primary design brief is extremely light weight and compact storage. No provision for outboard power or a sailing rig exists or will be made available. Drop us a line if you have questions about this new design!